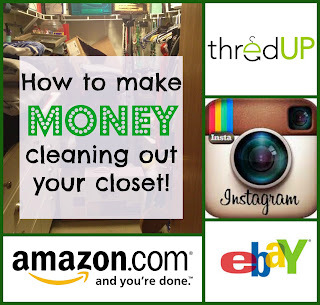 MamaInsomnia: Make money cleaning out your closets! 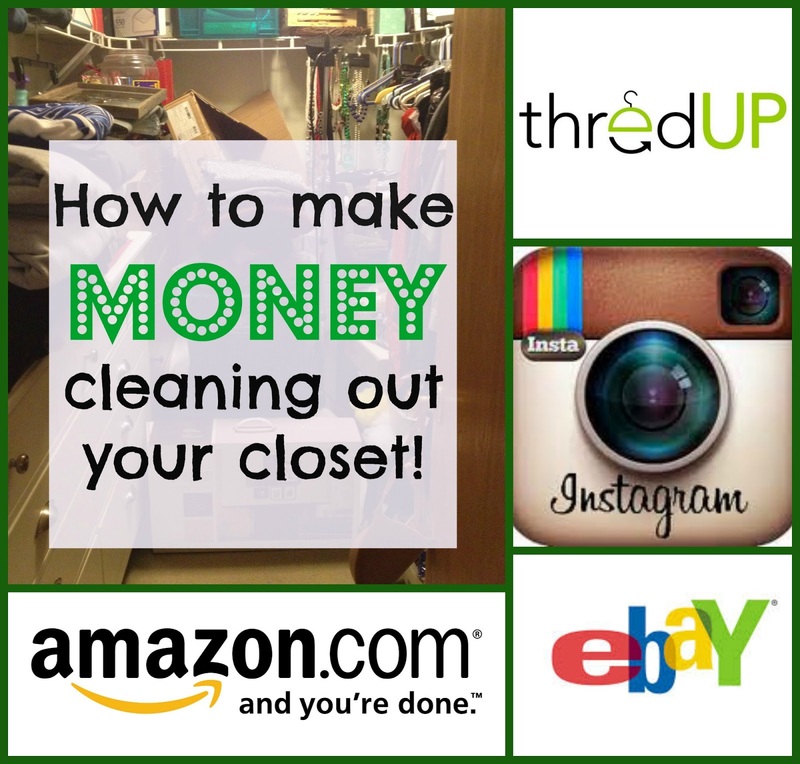 Make money cleaning out your closets! Spring cleaning in the Insomnia house means a lot of purging. Between the boys birthday's and the holidays, come January we are in dire need of a good clean out. Because you need to make room for all the new crap you'll get this year, duh?! My goal, when cleaning out the closets, is to get rid of stuff but to also make a little extra money if possible. I'm all for donating and handing stuff down, but since I only work part time, I am always looking for ways to make a little extra cash. First, I go through the closets with a garbage bag and throw away anything that is broken and beyond salvaging. You have to be realistic here. Yes, one mans trash is another's treasure, but in reality, some of it is just crap. Real Crap. In order to be successful at selling your items, you must know the difference between what is treasure and what is crap. Once I've cleaned out everything out, I put the things I am going to sell through my own tried and true 3 step process: Sell it online, have a garage sale, donate/give away the rest. This has generally worked out well for us since we live in the Midwest and have a good 5 months to wait before we can have a yard/garage sale. This system allows me to make the most profit AND get rid of the most stuff. ThredUp: Thred up is extremely appealing if you are short on time. They send you a bag and you fill it with gently used kids clothes then you send it to them and they list it for you. You get a payout of the sales from your items once they have been sold. Pros: Super easy, they virtually do all the work for you. You can use your payout to buy things from their site, donate the payout to a charity of your liking on their website, or they will credit the money to your Paypal account. Cons: This site seems to be geared towards higher end brands so it may only be worth it if you have these. Also, you have no control over the pricing or sale and once you send in the bag, it's a done deal. The company donates the clothes they don't use, they don't send them back, so there is a chance you could walk away with less than you wanted for your items (or nothing at all). Ebay: Probably the most well know of the bunch, Ebay is a great place to sell things. The great thing about Ebay is that it is very user friendly and you can sell virtually anything on it. Pros: Easy to use, lots of options for selling (auction, local listings), can sell almost anything, easy payment services and you can purchase all shipping labels via their site. Cons: There are fees, though nominal, for listing and selling an item. Also, the site is feedback based which means sometimes first time sellers can have a hard time getting sales with 0% feedback. I always encourage people to make a few purchases through the site to build up feedback. Craigslist: People have mixed feelings about Craigslist but my experience with it has been pretty positive. Best For selling: Furniture and big items that are too costly to ship. Pros: FREE, no fee for listing an item. Easy to use. Good for selling bigger items like furniture. Cons: Craigslist requires more duediligence than other sites. You will be responsible for responding to emails and setting up a time to make the transaction. Make sure you are dealing with a legitimate buyer and that you are firm in the payment you will accept. In my experience, I only accept cash and I make sure I have talked on the phone a few times with the person. DO NOT take checks and make sure you are safe when you have the person pick up the item. I always make sure that my husband and I are both home and I move the item to the garage so that the buyer can take it quickly without having to come in my home. Tip: If you are having a garage sale, list big items on Craigslist. People can come look at them/pick them up during the sale. Best for selling: clothes, small items like jewelry and accessories. Pros: Easy. Snap a picture, name your price and wait. Cons: Until you get a big following, you may not have many sales. Also, as the seller, you are responsible for the entire transaction. You must commit to a payment method, take care of the shipping and make sure that you are running a respectable business. Word of mouth travels fast on social media. Amazon: I love Amazon because they have anything and everything that you could possibly want, but did you know that they will also BUY your used CD's, DVD's, textbooks, old electronics and Video Games?? The great thing about this is you can see how much you'd get for them BEFORE you sell them. Best for selling: CD's, old electronics, DVD's and Blu Rays, video games, textbooks. Pros: get a quote for your stuff instantly, they provide all shipping labels and costs, get amazon gift cards. Cons: They don't offer cash payouts, only trade in for Amazon gift cards, so if you are not an Amazon shopper this probably isn't worth your while. How do you get rid of the things in your house? Do you donate or sell it?